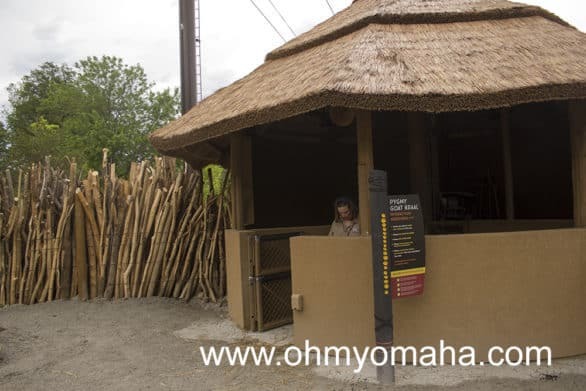 I had a sneak peek at Omaha’s Henry Doorly Zoo and Aquarium’s newest addition: The African Grasslands. It opens to the public this weekend. One of the few times you’ll see me being nice to a snake. 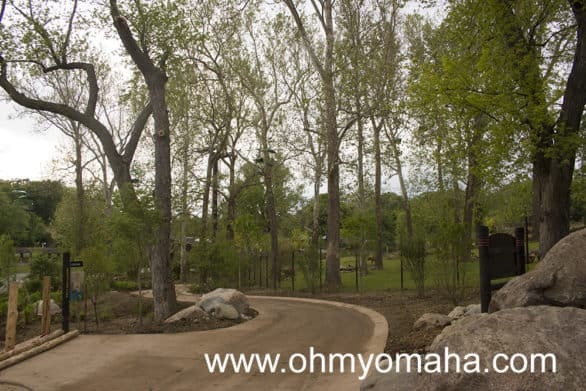 This area of the zoo is huge – it’s 28 acres and is by far the largest project ever undertaken there. This is just the opening of Phase I and there’s more to it than I had expected. You won’t recognize the area that once housed the rhinos. 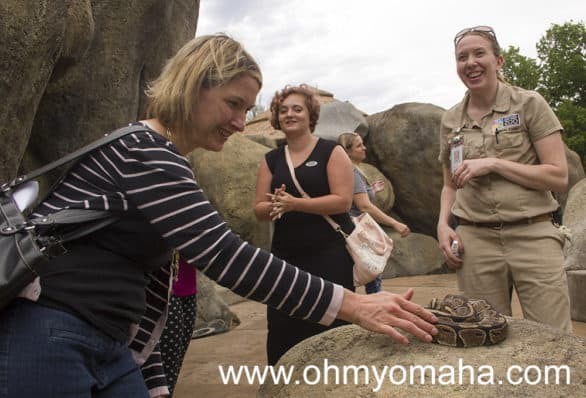 African Grasslands include major exhibits for elephants, giraffes, white rhinos, cheetahs and impala, as well as a children’s African pygmy goat petting area, mixed-species habitats, animal wading pools and interactive demonstration areas. There’s a whole new area with smaller species native to Africa located between the Skyfari and where the giraffes and ostriches will soon roam. Here, you’ll likely find an animal encounter (like the snake, Lucille, that I met above). The pygmy goat area is going to open. Your kids may recognize the goats – they were once part of the Red Barn exhibit. The pygmy goat petting area is near the train stop in the African Grasslands exhibit. There’s about six goats there, including a 2-month-old. The surprise, for me at least, is that the lion training center is almost completed, and lions are expected to move in by this weekend. Here, zoo visitors will be able to watch training up-close. There is a Pride Rock-esque area in the exhibit that will be heated. I heard the lions don’t mind the winters here and that heated rock will likely attract no matter the weather. They’re putting the finishing touches on the lion training area at the zoo. The lion area also has an area designated for games, where children can learn some traditional African games. 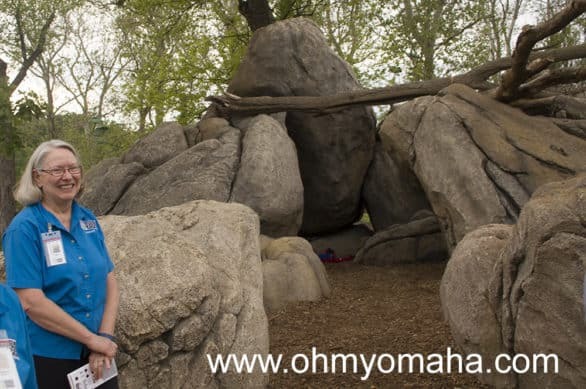 Kids can learn traditional African games in this area of the African Grasslands exhibit. 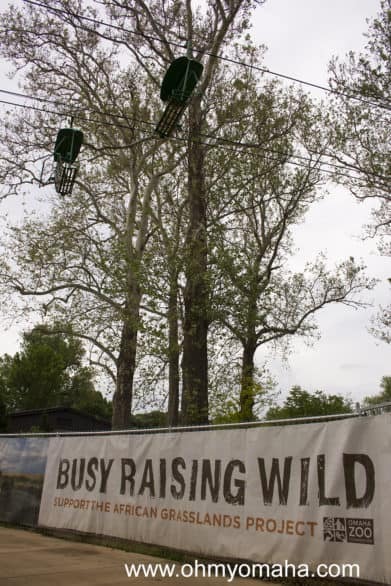 If you’ve visited in the last few months, you’ve likely seen some exhibit areas that were already, including the Giraffe Herd House and Elephant Family Quarters. The elephants can be spotted outdoors now. The African Lodge has indoor seating, bathrooms and water fountains. The outdoor patio seats overlooks animal exhibits. This is a great spot to eat a picnic lunch or purchase food at Tusker Grill. 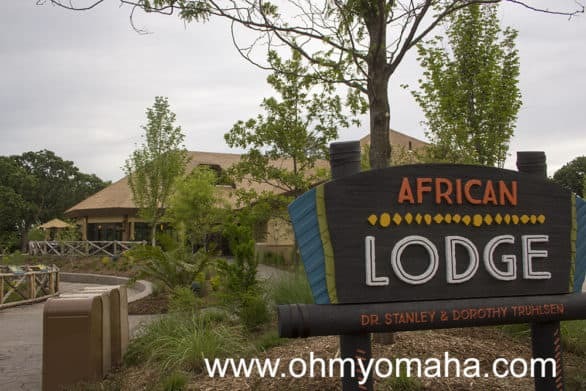 The African Lodge is also already open with indoor and outdoor seating. Tusker Grill sells concessions including some African entrees. 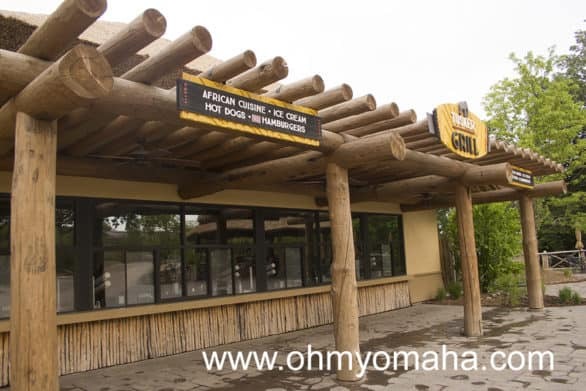 Tusker Grill is a chance to try some African food, as well as good old American zoo staples like hamburgers and hot dogs. The lagoon that had the koi and monkeys has been refilled, and now there is a new bridge on the south end of it. The monkeys are back, but now you’ll also find some pelicans and a flock of geese. The new Pelican Lake Bridge with a view of the south end of African Grasslands. Called Pelican Lake Bridge, it takes you to the east in of African Grasslands where you’ll encounter bongos and lions, hopefully, starting this weekend. There’s a display of one of the crates the elephants were shipped in as well as a helicopter. This area is unrecognizable from what it once was – and it’s a great thing! Bongos (or antelope) have already moved into their new home in the African Grasslands exhibit at the Omaha zoo. The giraffe feeding area looks like it’s nearing completion, but I don’t know the date when visitors can take part in this animal encounter (for an additional fee). Phase II, projected to open in 2017, will showcase Africa’s top predators and their prey near the Skyfari terminal and a safari tent camp for those who want to try out an overnight stay at the zoo. Construction continues on the African Grasslands project.